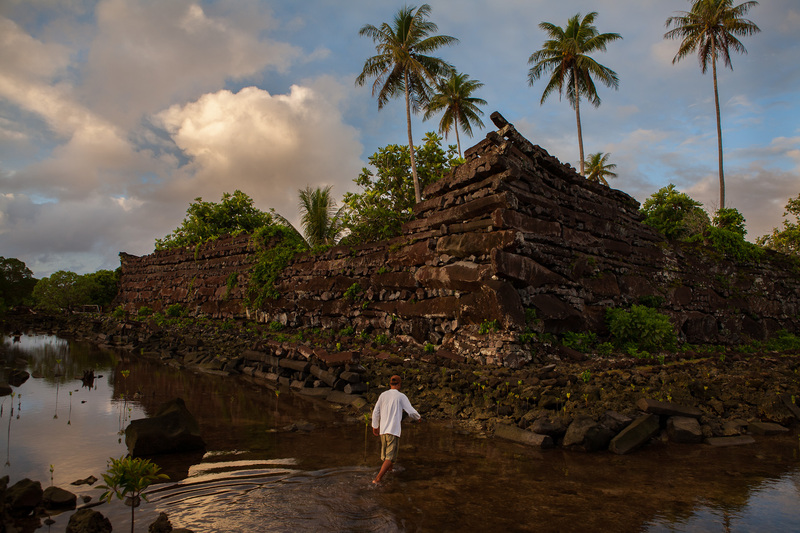 The ancient ruins of Nan Madol on Pohnpei island Micronesia. This site consists of no fewer than 93 man made islands that were the center of a unified, island wide chiefdom called the Saudeleur dynasty. The Saudeleur dynasty had broken down and been replaced by a fragmented chiefdom by the time of European contact. These ruins were under construction as early as 1200 ad although the site has been occupied since at least 1ad. Pat Kirch (Road of the Winds 2000 pp196-200) suggests that pottery found below the tide line on several of the artificial islands suggests that the islands themselves were built over previous Lapita style stilt houses that date from the time of first human occupation. Nan Madol would then represent an “ur-settlement” or the original site of human occupation on the island. That is why it became such an important ritual center. The largest structure, the tomb islet of Nandauwas was the resting place of Saudeleur rulers. The walls of megalithic rock still rise more than 20 feet.